Peel Plateau Lake after the drainage event. Peel Plateau Lake in Canada's Northwest Territories looks a lot different now than it did a week ago thanks to a dramatic -- yet expected -- drainage event. 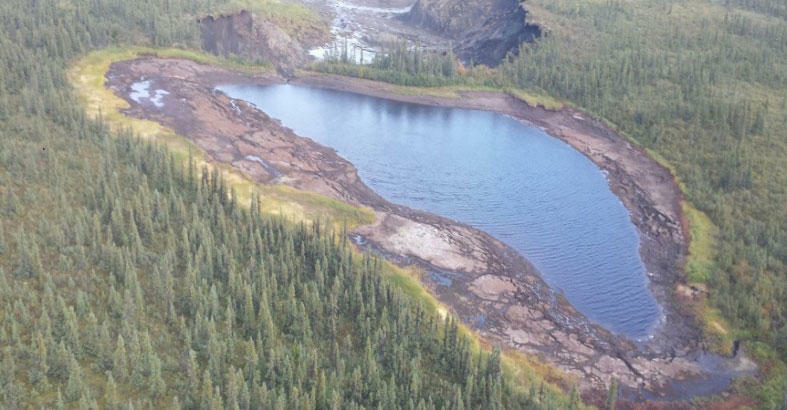 Canada's Northwest Territories Geological Survey reports that the small, isolated body of water drained over the edge of a cliff earlier this month. The permafrost that originally supported the lakebed gradually thawed, spurring an event known as a thaw slump (essentially a cold-climate landslide) when the cliff supporting the lakebed gave way. "When the slump eroded to the edge of the lake, about half of the lake volume estimated to be about 30,000 m3 drained in about 2 hours by pouring over the slump headwall and forming a temporary waterfall 10 to 15 m high," the agency explains in a news release. "Peak flows lasted less than 30 minutes and flow rates reached at least 10 m3/second." NTGS says on its website that this particular thaw slump had been developing for nearly a decade. Authorities re-issued a geohazard advisory over the summer, one month before a partial drainage event occurred. Due to rising air temperatures and increased rainfall, such thaw slumps have become increasingly common in recent decades. Large, rapidly moving quantities of water can be detrimental to local ecosystems, as they transport sediment and debris across long distances, potentially creating dams and impacting waterway ecology. For example, ecologists noted that the turbidity (a measure of the cloudiness caused by the number of large particles in water) of the downstream lake into which Peel Plateau Lake emptied was noticeably higher following the drainage. High turbidity can block sunlight's ability to penetrate water, impacting plants and animals that live on the lake floor. "In 2016 NTGS and University and Government partners will further investigate the impacts of slumps on landscapes, streams and lakes and explore the use of remote sensing to better monitor the landscape changes," the agency adds.